Amicus Curiae (a 'friend of the Court') is the official journal of both the Institute of Advanced Legal Studies, University of London and its Society for Advanced Legal Studies. Amicus Curiae aims to promote scholarship and research that involves academics, the legal profession and those involved in the administration of law. Amicus Curiae carries articles on a wide variety of topics including human rights, commercial law, white collar crime, law reform generally, and topical legal issues both inside and outside the UK. The print journal began publication in 1997 and is published 4 times a year by the Society for Advanced Legal Studies at the IALS. The 4 most recent issues are available exclusively to subscribers to the print journal and to members of the Society. Publishing Amicus Curiae online in the SAS Open Journals System has given us the chance to unlock past work, which is often revealed to have contemporary resonance and context. This freely available online version includes searching/browsing and finding/using tools which extend research value, and delivers social networking tools to offer further dialogue on current legal topics. 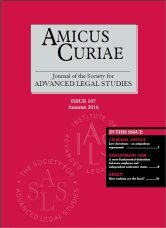 Amicus Curiae published its hundredth issue in October 2015. Many congratulations and thanks to Professor Barry Rider (founding General Editor), Julian Harris (Deputy General Editor), the Advisory Boards, consultant editors and all contributors and readers. Amicus Curiae welcomes contributions, which should be accompanied by the name and contact details of the author.